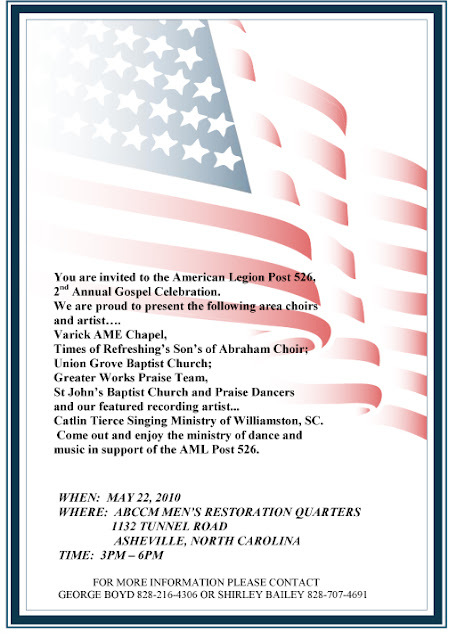 American Legion Post 526 is hosting its 2nd Annual Gospel Celebration on May 22nd from 3 - 6 p.m. at the ABCCM facility on Tunnel road. 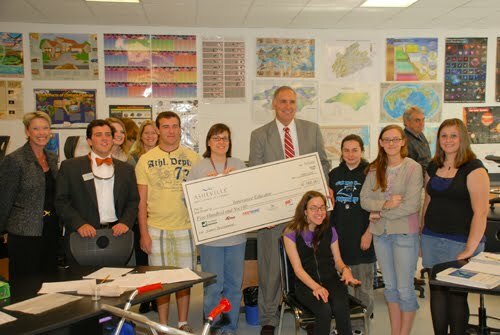 On Friday, April 23, a delegation of business and education representatives visited classrooms in the Asheville City, Buncombe County, and Madison County school districts to surprise and recognize three creative educators for outstanding career preparation efforts for their students. 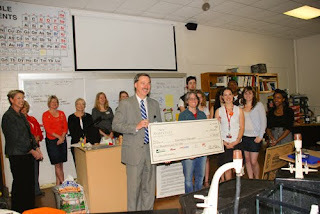 Each educator was presented with a check for $500 to be dedicated to their innovative programs. The Innovative Educator program was created in 2005 by the Partners in Education Advisory Committee of the Asheville Area Chamber of Commerce, which includes representatives from Asheville City Schools, Buncombe County Schools, Madison County Schools, and Asheville-Buncombe Technical Community College. Twenty-one educators have been recognized since 2005 for their job-readiness programs. Kimberly Novak is an Anatomy & Physiology, Earth & Environmental Science teacher at Madison County High School. Ms. Novak has focused on exposing her students to careers in the medical field and computer technology. Hands-on opportunities have included fields trips to "Bodyworks", a display at the Discovery Place in Charlotte, and bringing the DESTINY Bus to Madison. The DESTINY bus is a 40-foot science laboratory on wheels created by the University of North Carolina and Chapel Hill. Ms. Novak also focuses on sustainability by studying alternative energy and spearheading the recycling program at Madison County High School. Ms. Novak and her classes monitor the wind-turbine installed in October 2009 by Progress Energy as part of her curriculum. Adam Bachmeyer is a Career and Technology Education teacher at Enka Middle. 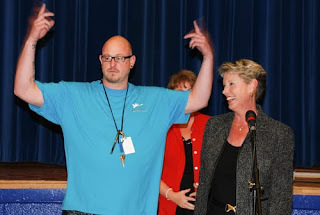 He has taught with Enka Middle for three years. Mr. Bachmeyer teaches his students to think and work in a team, a skill necessary for many careers. He incorporates many hands-on-learning experiences in his curriculum making his classes interesting and relevant. Mr. Bachmeyer also provides students with and afterschool club called Technology Students Association. TSA is a national club focused on Flight Distance, Robotics, Automotive Design and Fashion design. Cindy Byron is a Earth & Environmental Science and Chemistry teacher with the School of Inquiry and Life Sciences at Asheville High School. Ms. Byron's work in grant writing has awarded her students two opportunities focused on sustainability. In 2008-2009 Ms. Byron wrote a grant and worked with the Asheville High Metals teacher to retrofit a conventional truck into an electric vehicle. The truck won two awards at the SMARTT Challenge (Students Making Advances in Renewable Transportation Technologies) sponsored by NC State and NC Solar. Ms. Byron's second grant was for the SILSA Sustainability Project. Students competed for portions of the grant to implement a sustainability project on Asheville High's campus. She obtained guest speakers and arranged fieldtrips to aid her students in their research for their projects. Participants included NOAA Climate Change, Canary Coalition, Asheville HUB, Appalachian Sustainability Agriculture Project, Asheville City Schools Foundation, First Light Solar, Biowheels and Warren Wilson College. 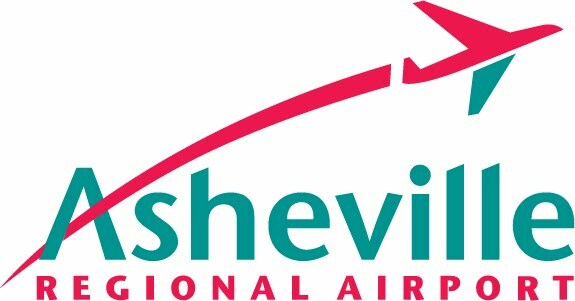 The Asheville Regional Airport Authority reported its largest month-over-month passenger traffic increase in more than four years. The month of March registered a 19.2% increase in enplanements over March, 2009, resulting in more than 4,000 additional passengers. The last increase of this proportion was September, 2005, when growth of 23.5% was reported. April of 2009 came close with a 17.8% jump. Factors influencing the boost include the acquisition of two new air carriers, AirTran Airways and United Airlines, and three new destinations, Chicago, New York, and Orlando, during that time period. This announcement comes on the heels of a recent AVL report touting a 4.1% increase in 2009 over the 2008 passenger traffic figures. Western North Carolina and Upstate South Carolina can access the knowledge and experience of ten internationally-acclaimed leaders by attending the Chick-fil-A Leadercast at First Baptist Church in Hendersonville on May 7, 2010. Jim Goodnight, CEO of SAS Institute, Inc. The idea for the Chick-fil-A Leadercast was conceived ten years ago by Dr. John C. Maxwell, “New York Times” best-selling author and speaker. He wanted to combine his influential voice in the community with his desire to reach leaders at the heart level. "The event was a highlight in my development,” said Jennifer Boubel, director of field services for Continental Airlines. “Each speaker brought insights that were inspiring. It is an incredible way to improve upon our leadership so that in turn we can make a difference in the lives of those we influence." This year’s program will focus on how individual and teams can be the one to make a difference at work, at home and in the community. The ten speakers will speak on subjects such as connecting with others, standing out amid the competition, ideas for creative problem solving, leading in challenging circumstances, creating strong team cultures and how to avoid, detect and reverse decline. 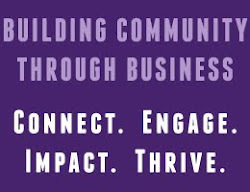 Area sponsors making this event possible include United Community Bank, Henderson County Chamber of Commerce, HomeTrust Bank, Parsec Financial, First Baptist Church of Hendersonville, and Power-Up! Proceeds will benefit non-profit organizations focusing on the future leaders of tomorrow: Junior Achievement of WNC, Henderson County Young Leaders Program and Crosswalk of Hendersonville First Baptist Church. For more information about the Hendersonville Chick-fil-A Leadercast, visit 2powerup.com. Registration and tickets can be purchased online at 2powerup.com or in person at the Henderson County Chamber of Commerce or the Asheville Visitors Center. Tickets must be purchased by April 28th. For additional information, call Sherri Holbert at 828-664-3649. United Services Credit Union, a local not-for-profit financial institution, is helping its members achieve their dreams of a higher education with their third annual scholarship program. Four credit union members, already attending or admitted to an institution of higher education, will receive a $750.00 scholarship each to be awarded during the credit union’s 54th Annual Membership Meeting on April 20, 2010. This is a merit based scholarship; applicants must submit proof of enrollment at an institution of higher education, proof of GPA, the minimum is 3.0, and a one page essay highlighting their achievements in high school or college as well as their community involvement and volunteer activities. A committee of five community leaders reviews the entries to select the four winners. Volunteering their time in the committee are Fernando Little, Director of Human Resources at Mission Hospital, Allison Jordan, Executive Director of Children First of Buncombe County, Janet Moore, Director, Community Relations, Marketing & Communications at Mission Hospital, James Carter, Director of Membership Sales at the Asheville Area Chamber of Commerce, and Holly Waltemyer, Assistant Director UNC Asheville Career Center. United Services Credit Union would like to thank the committee their time in selecting four deserving winners. Next Step Recovery, Inc. has received a $15,000 grant from the Janirve Foundation to support its transitional living programs for men and women recovering from alcohol and substance abuse. The foundation’s generous grant brings Next Step Recovery halfway to its goal of raising $30,000 in its first Annual Campaign launched earlier this spring. Next Step Recovery operates a transitional living program for men in Asheville’s Montford’s district. The nonprofit’s women’s program is located in a historic property that was once home to Weaverville’s first mayor and most recently the site of the Secret Garden Spa and Japanese gardens. Research has shown that in addictions recovery, long-term success is greatly enhanced through participation in structured transitional living programs. Next Step Recovery’s unique program features include onsite relapse prevention education, 12-step support for substance abuse and addictions issues, a life-skills training program, an outdoor adventure program, structured supervision and social support in a home-like setting. The Janirve Foundation is a private grant-making foundation established by the late Irving J. Reuter, an executive in the automobile industry. Janirve has a strong commitment to supporting and improving the quality of life for families in Western North Carolina through higher education and human services such as child welfare, family services and housing programs. For more information about Next Step Recovery, please visit nextsteprecovery.com or nextstepforwomen.org or contact Executive Director Susan Stader at 350–9960. (March 25, 2010) -- Ron Morin was promoted to Vice President and Managing Director of The Grove Park Inn Resort & Spa today. Morin celebrated his 25th year as a member of The Grove Park Inn Resort & Spa family in 2009. Beginning as a line staff employee in Food & Beverage in 1984, he has worked in many areas of the resort in both hourly and management positions. Morin has been a member of the Resort’s Operations Committee for more than 10 years. As Vice President & Managing Director, Morin is responsible for the 512 room resort, which sits on 150 acres and includes a Donald Ross designed golf course. He oversees a staff of more than 900 employees in areas as diverse as lodging, retail, food & beverage, golf, sports club membership and a commercial laundry. Morin has worked with Historic Hotels of America (HHA) since 2005 and currently serves as vice chairman. In October 2010, he will become the chairman of HHA. Morin also serves as a Vice Chairman of the Buncombe County Tourism Development Authority, a board member of The Health Adventure / Momentum Science Museum and as a board member of the North Carolina Restaurant & Lodging Association, as well as its Government Affairs Committee and Lodging Issues Council. He is a graduate of Leadership Asheville 23 and is a Certified Rooms Division Executive with the American Hotel & Lodging Association. Morin lives in Flat Creek with his wife Anna, son Eric and daughter Alexandra. CHAPEL HILL, N.C. -- The University of North Carolina Board of Governors on Friday approved UNC-Chapel Hill's plan to expand its pharmacy-education program to UNC Asheville in partnership with Mission Health System. The UNC Eshelman School of Pharmacy in Chapel Hill will create a satellite pharmacy program that will be based at UNC Asheville. The program at UNC Asheville is an expansion of the successful partnership the UNC-Chapel Hill pharmacy school has had with Elizabeth City State University since 2005. That program will graduate its second class in May. The start-up costs for the program will be covered by a $2.5 million fund-raising initiative spearheaded by the Asheville Area Chamber of Commerce. The Buncombe County Board of Commissioners has pledged $600,000 toward that goal, and the City of Asheville has pledged $100,000. By the fourth year of the program, its cost is projected to be fully covered by tuition and by Mission Health System funding half the clinical faculty's salaries. The partnership program should not require any state funding. Asheville was considered the natural choice for locating a satellite program because of the close working partnership between UNC Asheville, Mission Health System, and UNC-Chapel Hill. UNC Asheville, a nationally ranked public liberal arts college, is noted for its strong science and mathematics programs. "The arrival of the Pharmacy School to UNC Asheville is a prescription for a healthier population and a healthier local economy. Today’s decision by the UNC Board of Governors builds on the work of Mission Health System, the Mountain Area Health Education Center and the Western North Carolina Health Network, a consortium of 16 regional hospitals," said Rick Lutovsky, President and CEO of the Asheville Area Chamber of Commerce. "These organizations, along with physician practices and the many local businesses that support the hospitals and physicians, comprise a significant economic engine for our region. The Pharmacy School will only strengthen that engine, which is why the Asheville Area Chamber of Commerce is committing time and resources to raising the $2.5 million needed to fund the program. It’s an investment in Asheville’s future and the UNC School of Pharmacy that will pay dividends for years to come." The Asheville community is well known in pharmacy circles for the very successful Asheville Project, which began as a collaboration between the highly ranked UNC Eshelman School of Pharmacy, Mission Health System, the City of Asheville and community pharmacists. It is a multidisciplinary program of care for people with chronic conditions such as diabetes, asthma, high blood pressure and high cholesterol. It has been widely recognized and copied all across the country. The project provides intensive education to people with these conditions through their employer's health plan. Patients are also teamed up with community pharmacists who help them understand how to use their medications correctly. The project has resulted in a system in which community pharmacists have developed thriving practices that have improved their patients' health while saving money. 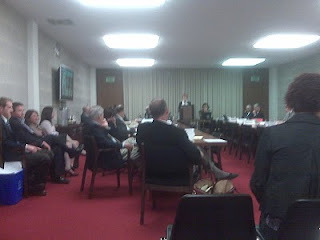 On April 7, 2010, eight members of the Western North Carolina Corridor Passenger Rail Committee ventured to Raleigh to make a presentation to the House Select Committee on a Comprehensive Rail Service Plan for North Carolina. The delegation from WNC arrived in beautiful downtown Raleigh in time for our 11:30 a.m. lunch meeting with the NC DOT Rail Division. Our delegation was joined by several NCDOT Rail Division staff members. They included Patrick Simmons (Director), Allan Paul (Director-Operations and Facilities), Cheryl Hannah (Rail Planner), and Shirley Williams (Director-Environmental and Planning). I want to say a big thank you to the Rail Division for their help over the last couple weeks for their help in preparing our presentation for the committee. Following lunch, the group loaded up and walked across the street to the legislature for a full afternoon of meetings. Western North Carolina’s Rep. Rapp chairs the house select committee and has been a strong advocate for passenger rail’s return to Western North Carolina. While waiting for our turn to present we heard presentations dealing with rail logistics, the state rail plan update, and North Carolina’s shortline railroads. Finally, it was the WNC Corridor Passenger Rail Committee’s turn to present. Judy Ray spoke about the conception of the group and the work the organization has done over the past decade. This included 140 resolutions of support for passenger rail by North Carolina towns, municipalities, and organizations. Judy’s presentation was followed by Lance Hight highlighting the redevelopment progress Conover has had in restoring their depot. Conover is a great success story as the town is converting an old factory into a community center and depot. Stephanie Monson and Brett McCall concluded the presentation by telling of Asheville’s renewed enthusiasm surrounding passenger rail. This included the Asheville City Council’s renewed resolution supporting passenger rail and Brett’s Facebook fan page (The People for Rail to Asheville), which now has over a 1,000 fans! Join now! The presentation was well received and Rep. Deborah Ross of Wake County followed with a question regarding the cost of bringing passenger rail to WNC. This was answered by Patrick Simmons of the Rail Division. He explained the corridor was estimated to cost $134 million or roughly $1 million per mile of track (much cheaper than highway). This trip to Raleigh marked 480 miles in the car on I-40 (see photo from road above). It was a great chance to show our state leadership the desire Western North Carolina has to bring back passenger rail. I look forward to one day traveling to Raleigh by train. The Director of the Governor’s Western Office contacted the Chamber today to let us know that Governor Perdue will host a press conference this Friday, April 9 at 10 a.m. on Wall Street. (exact location not definite, but probably on Wall Street at the staircase which connects to Battery Park Avenue). Governor Perdue will discuss a small business assistance initiative. 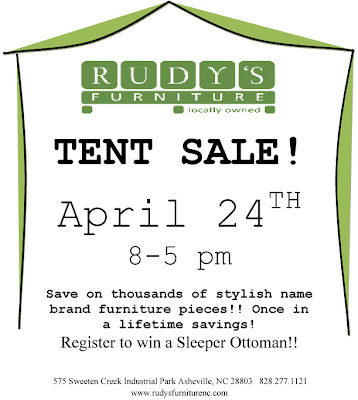 If you have questions, please contact Juleigh Sitton at 828-430-0054. 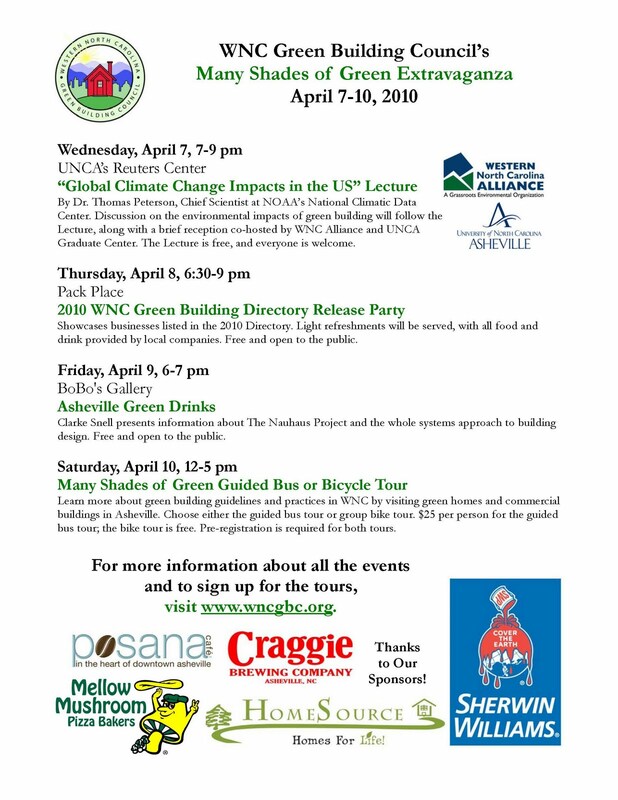 Take a bike ride through Asheville and learn more about green building during the Many Shades of Green Bike Tour on Saturday, April 10, 2010. The WNC Green Building Council is offering a cycling option to coincide with the guided bus tour. The bike tour will include a variety of green properties while also providing participants information on bicycle routes and alternative transportation options in Asheville. Avid cyclist Justin Mitchell, with Ecohouse/Dwell Realty, will lead a tour of seven properties ranging from a commercial green rehab to the first passive hempcrete home in the country. Green building professionals will be available to answer questions and provide information about green features and construction methods. The tour will originate at Biowheels Bike Shop and visit properties in the Downtown and West Asheville areas. The ride will be approximately ten miles in total distance; and due to the hilly nature of the Asheville landscape, a moderate fitness level is suggested. Helmets are required. Start: Biowheels: 81 Coxe Ave. Presentation at 12:00. Ride begins at 12:30. Biowheels is hosting a post-tour Reception with refreshments and light appetizers. For general information and to register for the tour, visit www.wncgbc.org, email office@wncgbc.org, or call 828-254-1995. For specific questions pertaining to the bike tour, contact Justin Mitchell at Justin@justinasheville.com or 828-713-9400.